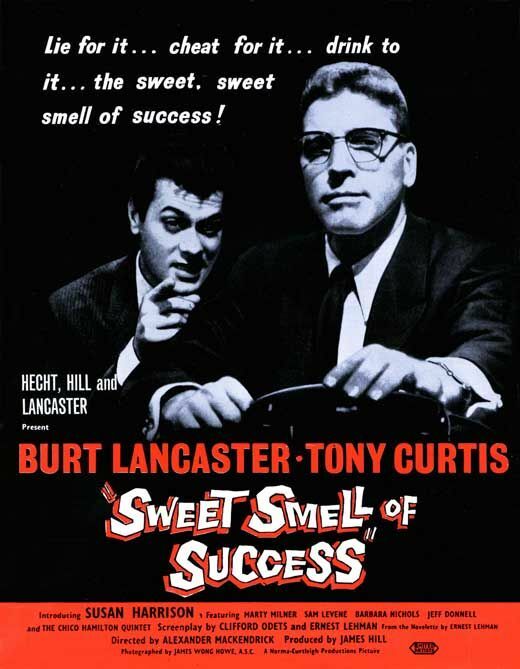 Sweet Smell of Success (1957), starring Tony Curtis and Burt Lancaster, is one of the 1001 classic movies you should see. Each Monday, I'm going to recommend a classic movie you should see (for the reasons behind the 1001 series and reviews of earlier films covered go here). This year's best picture Academy Award winner Spotlight has brought a renewed interest in the good, old-fashioned newspaper movie. Throughout September, I'll feature three great movies about the printed page. This week's selection is the film noir, Sweet Smell of Success (1957). FYI: Citizen Kane is a famous newspaper movie I've already written about during the May series on 1941 best picture nominees. Sweet Smell of Success follows ambitious New York City publicity agent Sidney Falco (Tony Curtis), who, in an attempt to get his clients favorable press coverage, will do almost anything to impress powerful newspaper columnist J.J. Hunsecker (Burt Lancaster). When Hunsecker asks Falco to help him get rid of a jazz guitarist (Martin Milner) who is dating his beloved younger sister (Susan Harrison), the greedy agent quickly accepts in a decision that will lead to betrayal, police corruption, and attempted suicide. Sweet Smell of Success came from a 1950 short story that writer Ernest Lehman based on his time as an assistant to powerful The Hollywood Reporter columnist Irving Hoffman. Lehman's script, which was later revised by playwright Clifford Odets, was rejected by most old Hollywood studios because of censorship concerns until the independent production team of Hecht-Hill-Lancaster made a film starring box-office sensations Curtis and Lancaster that was filmed on location in the Big Apple. The result was a resounding flop -- many of Curtis' teenage fans were deeply disappointed to see him playing an amoral character -- but, in recent years, the movie has been acknowledged as a noir masterpiece that gives an ugly but honest take on the power of the press in the 1950s. Old Hollywood films usually portray newspaper columnists as neurotic egomaniacs, but even compared to the likes of Sheridan Whiteside (Monty Woolley) in The Man Who Came to Dinner (1942), Waldo Lydecker (Clifton Webb) in Laura (1944), and Addison DeWitt (George Sanders) in All About Eve (1950), J.J. Hunsecker is a certifiable weirdo. Hunsecker, as portrayed by Lancaster in a brilliant performance that should have won him every acting award on the planet, is a vicious, back-stabbing control freak with a habit of speaking in cryptic one-liners and an abnormal fixation on his sister's love life. He loves wielding his considerable power, whether it's chewing out a waiter for bringing him a warm drink or having Sidney plant marijuana on his sister's boyfriend. 1. Walter Winchell. Lehman based Hunsecker on newspaper columnist and radio personality Walter Winchell, who was one of the most powerful men in mid-20th century Ameria. Winchell was a much more complicated figure than Hunsecker, but he certainly had a nasty streak that included breaking up his daughter's engagement. 2. Cinematography. If you want to know what the Big Apple was like during the Mad Men era, watch Sweet Smell of Success. The great cinematographer James Wong Howe captures the brilliant glow of Time Square at night, the smoke-filled nightclubs like 21, and the crowded diners where you can get a milkshake and a hot dog while reading Hunsecker's latest column. 3. Curtis. 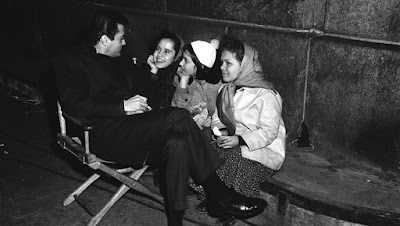 Curtis had a dedicated teenybopper fan base that loved seeing him in the silly costume dramas and comedies that made him a star, but Sweet Smell of Success proves that Curtis was more than just a matinee idol. His portrayal of the ambitious Sidney, who follows Hunsecker around like an eager puppy, is his career-best performance. 4 Music. Sweet Smell of Success features jazz music from the Chico Hamilton Quintet, but it is Elmer Bernstein's landmark score, which uses jazz and blues themes, that captures the melancholy tone of the film. Tony Curtis entertains some of his teenage fans while filming Sweet Smell of Success (1957). Other critics: Sweet Smell of Success has a 98 percent fresh rating at Rotten Tomatoes and Leonard Maltin praises the movie's "vivid performances, fine jazz score by Elmer Bernstein, outstanding camera work by James Wong Howe that perfectly captures N.Y.C. nightlife" in a three and 1\2 star review for his Classic Movie Guide. 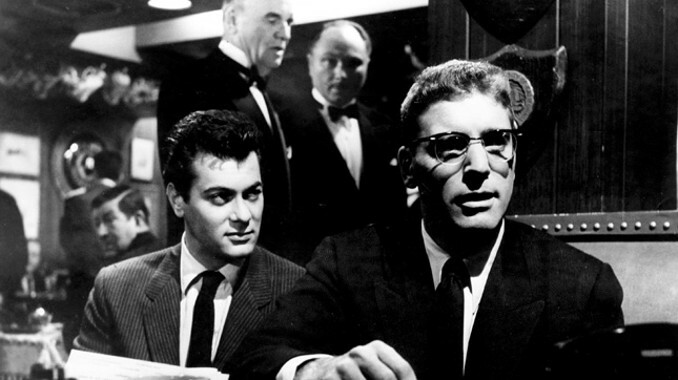 Although it was a box-office flop in 1957, many critics praised Sweet Smell of Success. The movie made it on several top ten lists, including those for the New York Herald and Time magazine, which praised the movie for its "intense acting, taut direction ... superb camera work...and, above all. . .its whiplash dialogue." The bottom line: Sweet Smell of Success is one of the best films noir ever made in the old Hollywood studio system. Watch it for career best performances from Lancaster and Curtis, the expose of the dark underbelly of print journalism, and, most of all, the stunning photography of New York City at night. Availability: Sweet Smell of Success is available on DVD, Blu ray, and video on demand. Next week, I'll wrap up the newpaper theme with director John Ford's masterpiece The Man Who Shot Liberty Valance (1962), which introduced the catchphrase "print the legend."